Mariah started her training contract as a Justice First Fellow with Norfolk Community Law Service in January 2017. Mariah completed her Law degree at the University of East Anglia and her Legal Practice Course at BPP Law School. Prior to her role at NCLS she had worked as a Paralegal at Mills & Reeve and had undertaken legal work placements at the Crown Prosecution Service, Eversheds and the Government Legal Service. 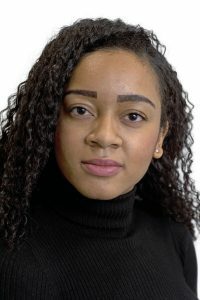 With a strong interest in social welfare law, Mariah hopes to build a career where she can make a tangible contribution to the lives of some of the most vulnerable groups seeking legal advice and representation in and around Norfolk. As part of her training she has been able to observe many of the legal services that the NCLS provides for vulnerable groups, including Family, Employment, Discrimination and Domestic Abuse advice sessions. Mariah is particularly keen to work with young people, having undertaken voluntary roles as a Teaching Assistant, International Student Mentor, Street Law Volunteer and Lessons from Auschwitz Student Ambassador. The aforementioned mentoring and teaching roles have highlighted the importance of educating young and vulnerable groups about their legal rights. Mariah hopes that in her project as a Justice First Fellow she will be able to make a positive impact on the lives of young people, supporting them to assert their rights confidently and effectively at a time where there are significant barriers to justice. This aim of this project will be to address the gaps in the provision of legal advice and representation for young people in the areas of housing, employment, family, discrimination and welfare benefits. To address the issues faced by young people, Mariah will be undertaking seats in these areas and will be working with the Mancroft Advice Partnership (MAP) who provide a range of services for 11 to 25 year olds in Norfolk.